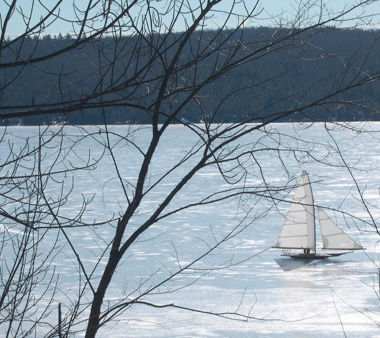 We recently reported on ice boating on Schroon Lake, after reader Tom Fallon sent us the above photo of a sail boat gliding over our frozen lake at quite a clip. This was the first ice boat we'd seen and our interest was piqued about this unusual winter sport. Now reader Bill Bernhard shares with us some history of ice boating -- both here in Schroon and the sports origins. For those of you who might be interested, the iceboat pictured is known as a South Bay Scooter. They had their origin in the early 1900's as a working class boat for Bay Men on the Great South Bay of Long Island NY. What makes them unique compared to a typical Ice Boat is that they have no tiller or rudder. They are steered by trimming the Jib and Mainsail along with shifting the weight of the crew. There also is no runner or blade typical of most ice boats, instead they have strips of metal on the bottom of the hull. Lastly and most importantly they will float and sail like a normal soft water sailboat when the ice gives way or runs out. They are still actively raced today. On the south end of Schroon Lake there are three more conventional iceboats sailing until the snow comes.